This biography of Clara Barton for children was excerpted from Mary Stoyell Stimpson's book, A Child's Book of American Biography (1915). Add over one hundred years to the time reference in her story. It was on the brightest, sunniest kind of a Christmas morning, nearly one hundred years ago, that Clara Barton was born, in the State of Massachusetts. Besides the parents, there were two grown-up sisters and two big brothers to pet the new baby. There was plenty of love and plenty of money in the Barton household, so the child knew nothing but happiness. Clara was a bright little thing. As she grew old enough to walk and talk, she followed the family about, repeating all their words and phrases like a parrot. She was not sure as to the meaning of all these words, but she liked the sound of them. Her father, who had fought in the French and Indian wars, had a fondness for the rules and forms that are used among soldiers. He taught her the names and rank of army officers. Also the name of the United States' president, the vice-president, and members of the president's cabinet. Clara's eyes looked so big, and her voice was so solemn when she babbled these names that her mother asked her one day what she thought these men looked like. "Oh," gasped Clara, "Papa always says 'the great president' so I guess he's almost a giant. I guess the president is as big as the meeting-house, and prob'ly the vice-president is the size of the school-house." The school-teacher sisters were busy with Clara so that she was reading and spelling almost as soon as she could talk. One of these gave her a geography, and Clara was so excited over it that she used to wake this poor sister up long before daylight, and make her hold a candle close to the maps so that she could find rivers, mountains, and cities. Stephen Barton, the older brother, was a wonder in arithmetic. It was he who taught Clara how to add, subtract, multiply, and divide. She made such good figures and so often had the examples right that she enjoyed her little slate next best to riding horseback with her brother David. David did not care much for study, but did like farm work and horses. He taught Clara to ride, and the two used to gallop across the country at a mad pace. She felt as safe on the back of a horse as in a rocking-chair. She did not look much larger than a doll when the neighbors first noticed her dashing by on the back of a colt which wore neither saddle nor bridle, clinging to the animal's mane, keeping close to David's horse, and laughing with joy. Sometimes Button, the white dog, tore along after them, trying his best to keep up with them. Button belonged to Clara. He had taken care of her when she was a baby, and very gravely picked her up each time she fell in the days when she was learning to walk. Stephen and David went to a school that was several miles away. They wanted to take Clara with them. It was one of the old-fashioned, ungraded schools, and the pupils were all ages. The snowdrifts were high, and Stephen carried Clara on his shoulder. Clara sat very quiet with her slate until the primer class was called. Then she stepped before the teacher with the other little ones. The serious man pointed to the letters of different words for each child, then he asked them to spell short words like dog and cat. When Clara was asked to do the same, she smiled at the teacher and said: "But I do not spell there!" "Where do you spell?" he inquired. "I spell in artichoke," she answered, looking very dignified. "In that case," he laughed, "I think you belong with the scholars who spell in three and four syllables." So after that, she spelled in the class of her big brothers. When Clara was twelve, she was very shy of strangers, and her parents thought it might help her to get over it if she went away from home to school in New York. She was a bright pupil and decided she would like to be a teacher like her two sisters. Clara made an excellent teacher, but was not very well and went to Washington, D.C., to work. While there, the Civil War broke out, and she offered her services as a nurse. Nobody doubted she would be good at nursing, for when she was only ten years old, she took all the care of her dear brother David, who was sick for nearly two years. She really knew just exactly what sick people needed. Clara worked in hospitals, camps, and battlefields all the time the four years' war lasted. Sometimes she had to jump on to a horse whose rider had been shot and dash away for bandages or a surgeon, and she was glad enough that David had taught her to be such a fine horsewoman. Clara helped every sick and wounded man she came across, and some people thought she should only help the northerners. But she did not mind what anybody said or thought. She made all the soldiers as comfortable as she could. And she was delighted when, four years later, while she was in beautiful Switzerland for a rest, she heard of the Red Cross Society. This society helped every wounded person, no matter what color he was, no matter what cause or country he fought for. Clara Barton worked with this Swiss society all through the war between France and Prussia. The foreigners called her the Angel. 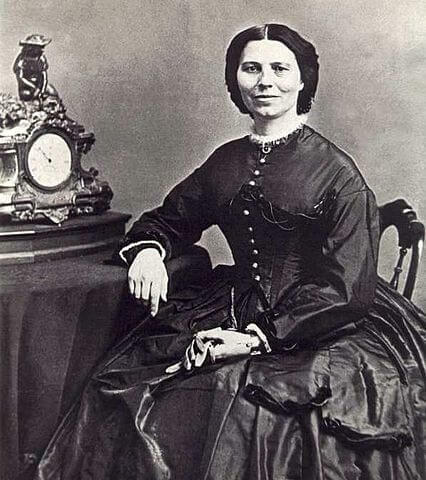 When Clara Barton came back to America, she tried a long time to have a branch of the Swiss society started in this country, but it was eight years before the Red Cross Society was actually formed in America. Then, because there was often sickness and suffering from fires and floods, as well as from wars, Miss Barton persuaded Congress to say that the society might help wherever there had been any great disaster. Miss Barton's name is known in Europe as well as in America. She did Red Cross work until she was eighty years old. Almost every country on the globe gave her a present or medal. When we think what a heroine Clara Barton proved herself, it would seem as if the little girl born on the sunny December morning was a Christmas present to the whole world. Clara Barton's story is featured in our collection, American Biographies for Kids. You may also enjoy visiting American History for more authors and their writings which helped shape the country. Add Clara Barton: A Child's Biography to your own personal library.